Shell length can be 100mm (Lindberg 1981) or greater (Raimondi et al. 2012). Shell is oval with a low profile and anterior apex. Exterior surface is chocolate brown with white markings (can have checker board pattern) and often rough and eroded. The interior is dark with a brown margin and prominent owl-shaped markings within bluish muscle scar. Side of foot is gray and sole is orange or yellow (Morris et al. 1980). 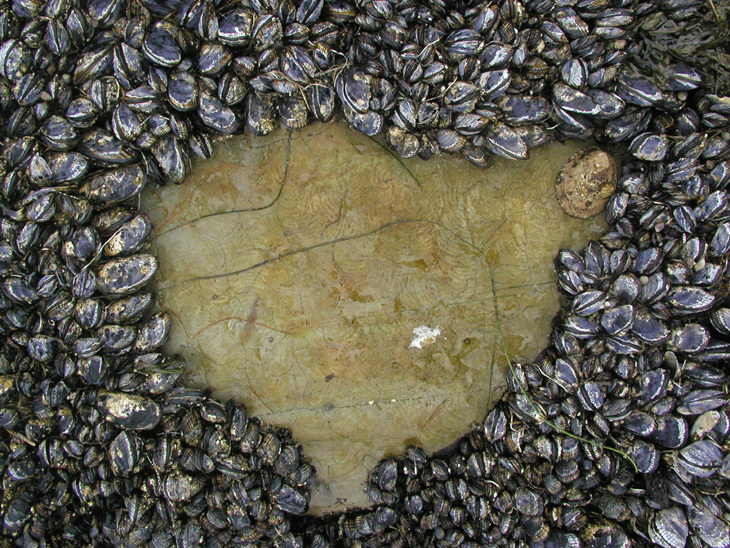 When on mussel beds apex is more centered and resembles Lotia pelta (i.e., smooth). Common on cliff faces and rocks on wave-exposed shores in the high and middle intertidal zone. Washington to Baja California (Morris et al. 1980). Scarce north of San Francisco. Distinguished from other Lottia spp. by large size, low height and anterior apex. Lottia gigantea can either be territorial, maintaining and defending clearings of thick algal film, or non-territorial, intruding on other limpets’ algal farms to graze (Stimson 1969. Shanks 2002). L. gigantea are protandrous hermaphrodites, with a transformation from male to female generally occurring in association with increased size, and the acquisition of a territory (Wright 1989). Thus non-territorial individuals tend to be the smaller males, while larger individuals are typically females with farms (Lindberg and Wright 1985). L. gigantea maintain territories on rocks by grazing or bulldozing other competitors for rock space (Stimpson 1970). This action creates space and promotes the algal growth upon which they graze (Stimson 1973). Territorial owl limpets, which can occupy the same farms for at least 4 years, have been shown to graze at much lower rates than non-territorial owl limpets, who must acquire food rapidly from another limpet’s farm before they are bulldozed off (Shanks 2002). Algal farms vary in appearance with L. gigantea size and structural features of the substrate, creating a patchwork of differing microhabitats. Lindberg et al. (1998) have shown that if L. gigantea are removed from an area, cover of erect, fleshy algae increases, followed by increases in the number of small limpets, thus changes in L. gigantea populations may greatly affect abundances of other species (Kido and Murray 2003). L. gigantea tend to occupy one or more characteristic “home scars” within their territories. Here the shell margin conforms to the rock surface, making a tight seal to hold moisture during low tide. The owl limpet can be found at the edge of mussel beds or under rock faces to prevent desiccation or decrease wave exposure (Raimondi et al. 1999). The largest limpets are estimated at 10-15 years old and are believed to breed in the fall and early winter in California (Morris et al. 1980). Although limpets and their feeding territories may be vulnerable to oiling, oil impacts are unclear. Owl limpets were not obviously affected by the 1971 San Francisco oil spill (Chan 1973), but recovery from any major disturbance likely would be lengthy (Raimondi et al. 1999). Commercial harvesting of L. gigantea is illegal throughout California, but recreational take of up to 35 individuals per day is allowed outside areas designated as marine reserves. Harvesters typically collect large, likely female individuals, which may skew the gender ratio of L. gigantea populations and decrease reproduction (Kido and Murray 2003). 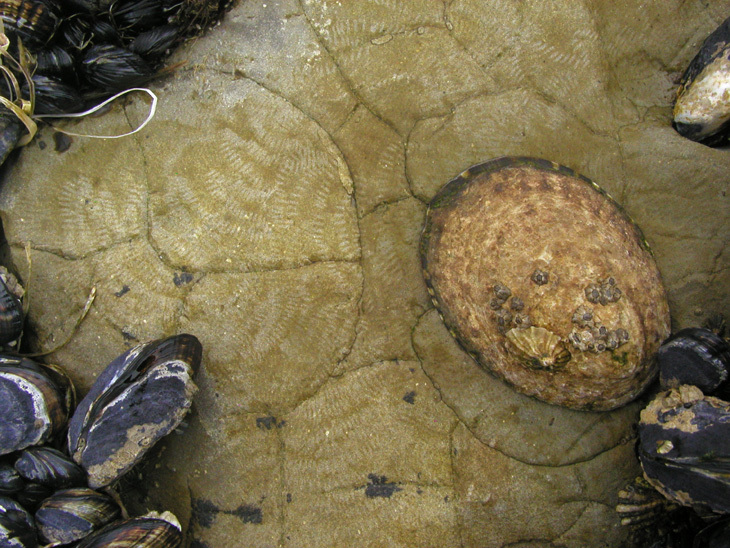 Illegal take is among the biggest threats to owl limpet populations, and assessment of long-term monitoring of L. gigantea shows that the amount of enforcement against poaching is a better predictor of size structure than proximity to population centers or visitation to intertidal sites (Engle et al. 2006).